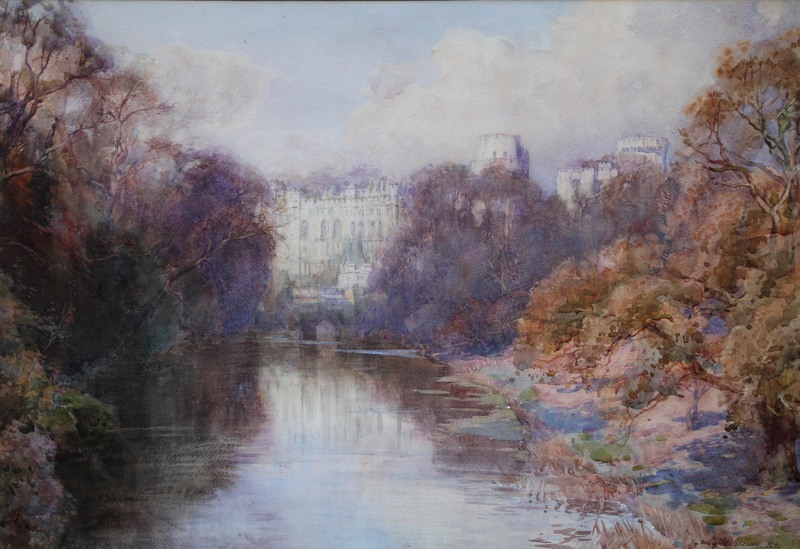 A large, fresh and vibrant watercolour view of Warwick Castle which was painted in 1917. The view is captured in detail by Henry Charles Brewer RI who travelled widely and exhibited at the major British art institutions including The Royal Academy. A lovely colourful view. Signed right and dated 1917. Midlands estate. Artist title and signed verso. Exhibition number on reverse of image. Frame 34 inches by 28 inches..
Henry Charles Brewer RI (1860-1955) was the son of the artist Henry William Brewer. He studied at Westminster School with Fred Brown and went on to exhibit extensively at the Fine Art Society, the Royal Academy, the Royal Institute of Painters in Watercolours, of which he was a member, and widely in the provinces and abroad. He was elected RI in 1914. Between 1899-1902 he exhibited at the Royal Academy. Brewer lived in London and painted extensively around the city.